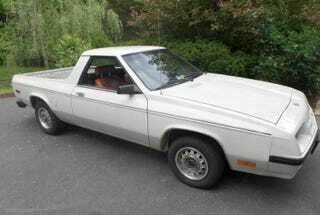 How About a Dodge Rampage for $1,950? Today's Nice Price or Crack Pipe Dodge is a classic mini pickup truck. It has to be a classic, it has Antique Vehicle plates! You'll just need to decide if its price puts it in a class of its own. A city near me is planning an upcoming car show that will highlight zero-emissions cars and those featuring green technologies. I'd like to show up to that event in yesterday's mid-engine 1972 Olds Vista Cruiser. It's not that I'm not green, or don't want to save the planet, it's just that I like to be contrarian. Of course with its 78% Crack Pipe loss, I doubt that custom will be showing up with a new owner at a car show of any kind anytime soon. If yesterday's Olds was like an all you can eat buffet of yesterday crazy, today's 1984 Dodge Rampage is more like off the secret menu of '80s cool with a side order of sanity, and just a little crazy thrown on top, just to spice things up. As you may recall, the Rampage was Dodge's little unibody trucklette based off the L-platform which had been designed by the French automaker - and one-time Chrysler subsidiary - Simca. So, the underpinnings are of Frenchorigin, and that means it's got to be weird, right? Nope. Eighties Chrysler-tastic? You bet. This truck looks to be in great shape for its 30 years and 144,000-plus miles. The bodywork seems straight, and there's no evident rust in either the pics or the description. Plus, all the trim seems to be intact. The styling of these little haulers has always been kind of odd. The nose of this later edition is a faithful reproduction of the Chevy Monza from a decade earlier, and it sticks out on an overhang that might lead you to believe the car has its engine sitting north-south. It doesn't however, the Rampage is an east-wester, and in this case the mill has been rebuilt just 25K ago. Which engine is that? Well, with no pics it's hard to say. It could be the 62-horse 1.6-litre from the aforementioned Simca, or Chrysler's own 2.2-litre 85-pony job. Whichever, it's backed up here by a manual gearbox. Hurrah! The interior looks to be an okay place to hang out, what with its deep-dish steering wheel and brown vinyl thrones. The carpet does look like you'd never want to go barefoot in there, but hell, a couple of Yosemite Sam floor mats are all it would take to fix that issue. These trucks are getting increasingly hard to find owing to there not having been that many to begin with, and the general tissue-paper and coma victim dream-like durability of these things in general. This one's a survivor, and to honor that fact, it has been anointed as an antique by its owner and the Commonwealth of Virginia. Being an antique usually means being expensive as all hell but in the case of this Rampage, the premium is not too dear. The seller is asking $1,950, and you now need to vote on whether, based on the ad, that sounds like a deal. What do you think, should someone drop $1,950 for this antique Dodge? Or, is that too much cabbage for this Rampage? Charlottesville Craigslist, or go here if the ad disappears. H/T to New-Jalop Dan for the hookup!